A life well lived tends to bring with it an accumulation of things and when the time comes to part with what’s collected, there are a few ways to do it. An estate sale is one option for people downsizing their home or dealing with the death of a loved one, to move quality items and antique on their next home. For Kristy Caronna and Robin Clem, organizing estate sales has not only become a healthy business, they’ve found great enjoyment in it. “It’s learning about people’s backgrounds, their lives. It’s like walking through history,” said Kristy. Organized and advertised in advance, estate sales are essentially a pop-up store in the sellers home, lasting two, three or four days, depending on the number of items, as a way to sell much of home’s contents in fairly short order. 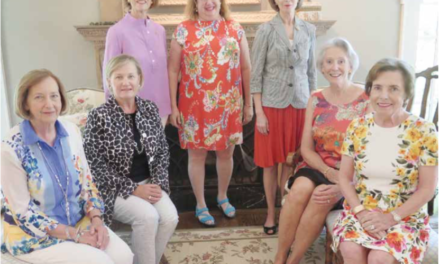 The mother-daughter duo at Caronna Collections began holding estate sales on the Mid-Shore when, years ago, a friend asked for some help in emptying a relatives home. They had been operating an antiques shop in Easton at the time and when store sales dropped off amid the economic recession, estate sales came to the rescue. “This just took off and the calls started coming in,” said Kristy. For Caronna and Clem, their sales start with assessing what items the individual or family wants to sell and researching their value. Years of experience in antiques gives them a good foundation, they said, but they still come across items that take a little more digging. Their biggest advice to those considering an estate sale for a home cleanout is to wait on throwing away until you’ve consulted with a sale organizer. Kristy said they’ve come to several homes to consult on a sale only to find the family threw out items that could have sold in the sale, and fetched decent prices too. “It’s just so crucial that people before they get rid of anything” make a call, Kristy said. However, often it’s Kristy and her mother urging family to keep more personal items that they initially choose to sell. Photographs, military accolades and uniforms and handwritten letters all fall in this category and they added they’ve seen many times where people had sold an item they later wished they had kept. “I don’t think they know the value, I don’t think they know the history behind it,” she said. In preparation, the house is staged for the sale with items cleaned, repaired if needed, and priced, many with details about its history and provenance. “We play music and burn candles. We just set up shop,” Kristy said. “We haven’t served wine yet but we may,” added Robyn with laugh. With most of their sales in Talbot County and around the Mid-Shore, Kristy said they’ve developed a sizable following of buyers that add to the community aspect of what they do. “People really love to come to the home and the property and see the piece in its original place,” she said. As sales head into the second or third day, the team with family members will decide on reducing prices to encourage more sales. What’s not sold is the heirs to decide, can be donated, or some items may be taken by Caronna Collections for its budding online auction. “Really, a lot of times we don’t have a lot left over,” Kristy said. What is often left, though, is a friendship between Kristy and Robyn and the sellers. “Almost every client has turned into a good friend,” said Kristy. They keep in touch with many people they’ve held sales for, even helping one client move to a new home after the sale.